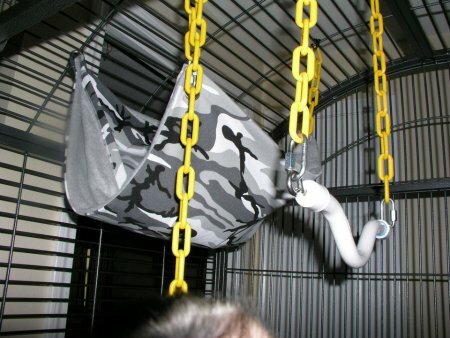 I’m always looking for new ideas related to primate enrichment and was pretty excited when I bumped into a trapeze monkey swing that David created for Sammy, his capuchin. All materials (including the trapeze styled pvc pipe) were purchase at home depot. 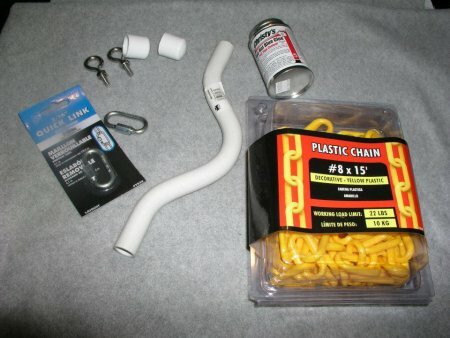 The total project cost was around $9 (cost of chain not included). Chain itself was around $12 but since he only used about 10% of the total chain link, the actual cost of the chain for this project would be around $1-$2. Once you have all the materials it’s a 10 minute project so let’s get started! Materials used in this project: pvc pipe, 2 pipe caps, 2 eye bolts (with nuts), 2 links, 2 washers, and pipe glue. Thanks Dave for pictures and info!